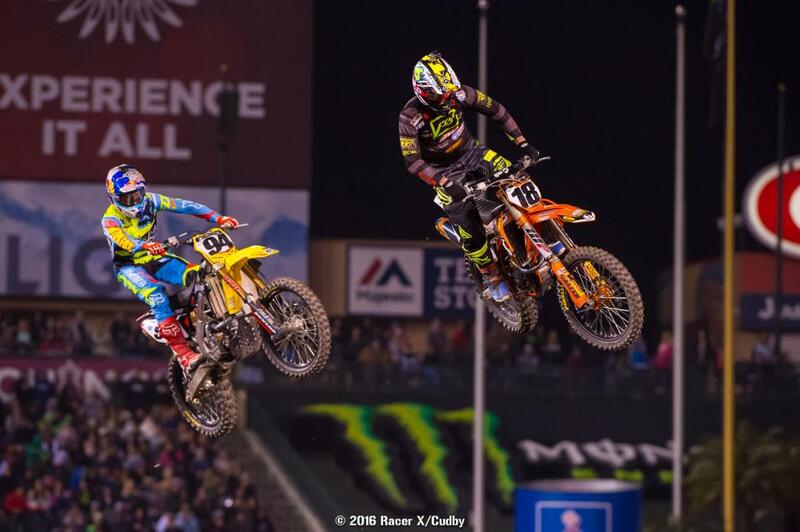 Round three of Monster Energy Supercross was perhaps the best one yet. The track was great, the racing in both mains was exciting and the stands packed. Yeah, it’s a bit late but welcome to SNL from the stadium by the Big A! The track, as, mentioned was really good. It was long, it had some great combos that only a few riders could do and two sets of whoops, and one set was huge! And because of watering, maybe some recent rains in Socal and an overcast day, the moisture stayed in the ground as well. We saw some outdoor motocross-style ruts out there in the turns. An amazing track in my opinion. Red Bull KTM’s Ryan Dungey won his second straight 450SX main event and in the three races this year, he’s gone 2-1-1. He’s got a 13-point lead in the standings and his main competitors better watch out or this thing could be over. 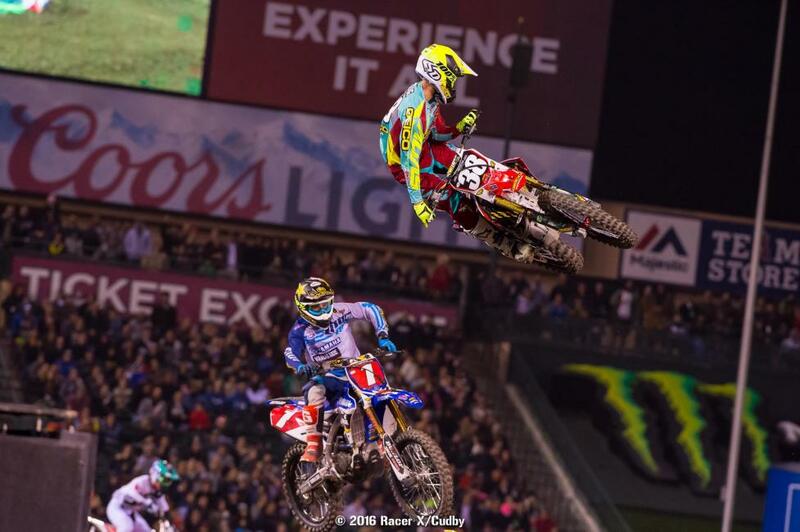 In Anaheim, he got a great start, made an early pass on leader Davi Millsaps, and simply rode away from everyone. The margin of victory over Reed was probably a bit less than he wanted it to be but he cruised through the monster whoops there on the last lap. Team Yamaha’s Chad Reed (still weird to type that) rode a great race to get second. 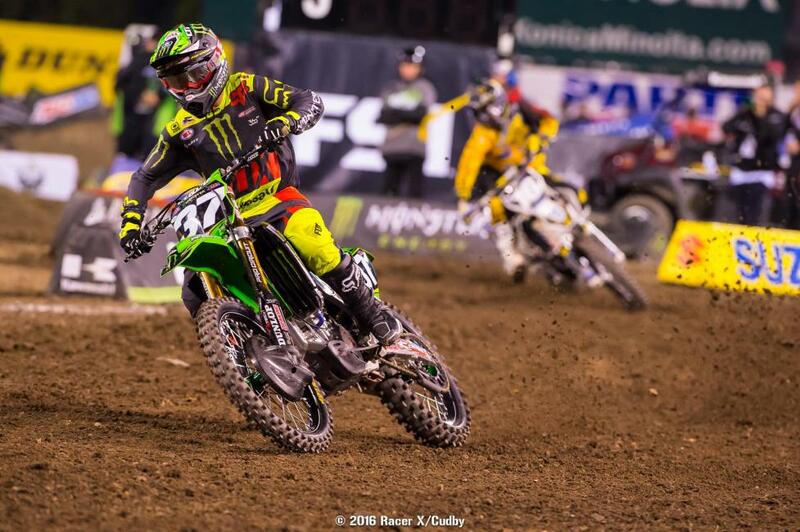 The Monster Energy/360Fly/Chapparal backed Reed got a great start and stayed in second pretty much the whole race but some mistakes caught up to him, as did Monster Energy Kawasaki’s Eli Tomac and Jimmy John’s Suzuki Kenny Roczen. With three laps to go, Reed had some serious heat on him from both riders. He was using a triple-triple into a rhythm section to his advantage but once he stopped doing that, there went his advantage. 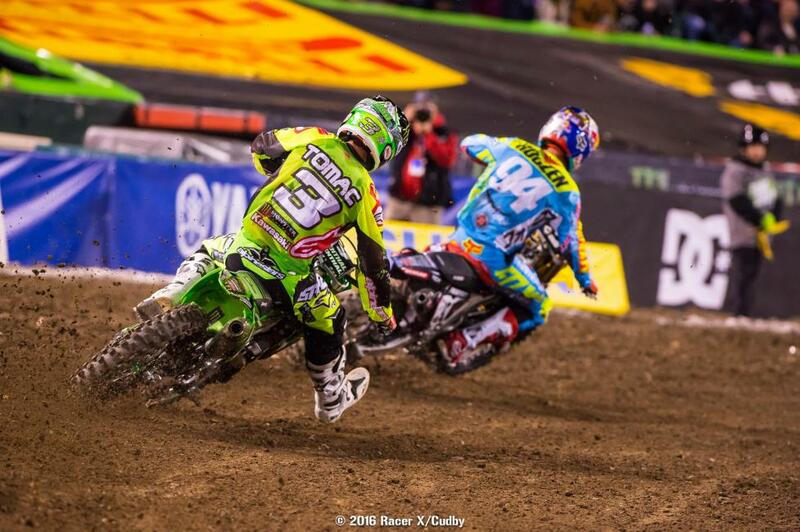 Tomac was poised to make a move before washing out, and that gave Reed the breathing room he needed to take it home. After the race, Chad said this would normally be a track that favors him but he didn’t ride as well as he had hoped. Whatever, Chad Reed is now second in the points, people! As far as Roczen, he snuck by Tomac when the green machine was on the ground to get his first podium of the season. Tomac took his third-straight fourth place. Can’t say he hasn’t been consistent! Tomac was the only rider going quad-quad and landing right into the sand. It was very impressive and perhaps just a tad faster but after the race Tomac mentioned that he felt 100 percent comfortable doing it lap after lap. Tomac looked better than he did at the first two races, and Roczen is finally on the podium, but both Roczen and Tomac have to, repeat have to, get off the line better ASAP or this title fight will be over. 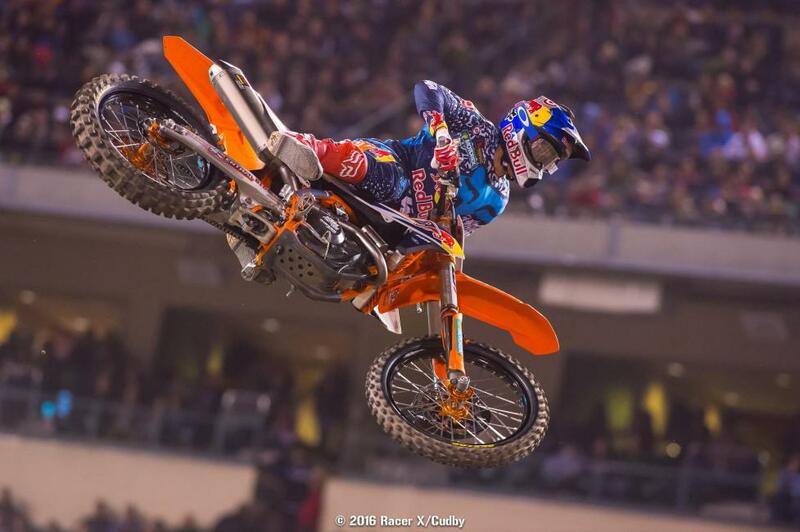 Dungey is a damned machine right now. 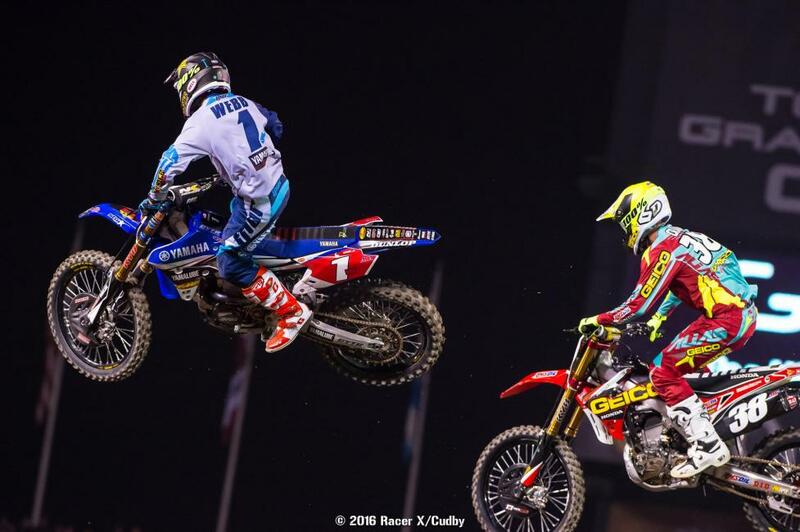 Yamalube/Star Racing Yamaha’s Cooper Webb took his third straight win in the 250SX class but this one was far from easy. Webb diced back and forth with GEICO Honda’s Christian Craig, who had beaten him in the heat race, for several laps. It was some great racing and more importantly, clean racing. Tremendous rides by both riders and it had the crowd on its feet. Craig eventually relented, saying that all that intense battling with Webb left him tight. 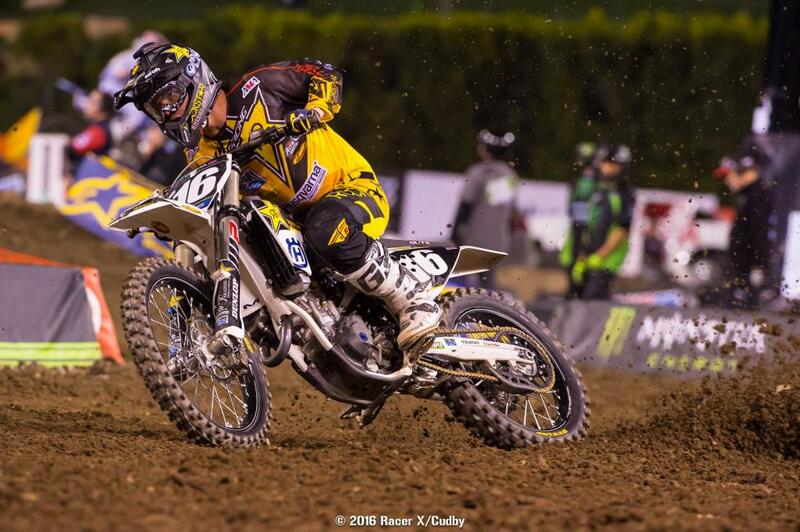 That allowed Rockstar Husqvarna’s Zach Osborne by him, and Craig didn’t put up a fight. Still, it was a great night for a guy that had retired for a few years. This was Craig’s first ever heat race win and podium. BTOSports KTM’s Davi Millsaps had his season best result with a seventh and the race also saw him grab the holeshot and lead some laps. It was a nice race for the #18 and his team. After his terrible year last season, he’ll take it. Rockstar Husky’s Jason Anderson had a small goggle issue out there and didn’t feel comfortable pushing his way to the front. He ended up with a fifth on the night after his issue and bad start. Rough night for Honda’s Trey Canard who fell in the first turn in his heat and cut his hand up. He lined up for the semi, made the main and once there, he and BTOSports KTM’s Justin Brayton hit and sent Canard off the track. He rode off after that. We hear from Honda that Trey already had a groin injury coming into the race, and the main event crash aggravated that. The hand will require stitches but it’s not broken. A rider that had it worse was Red Bull KTM’s Dean Wilson who injured his knee in practice and word is the prognosis isn’t good. Wilson tore his ACL at nearly this exact same time last year--let's hope that isn't the case this time. All told there were six riders that crashed in the whoops in the 250SX main event as the smaller bikes were chewed up and spit out. Star’s Alex Martin had a really tough time in them as did GoPro/TLD KTM’s Mitchell Oldenburg. Credit to Oldenburg, though, he rode great to come back from that crash to get into the top ten. The MAD/Dirt Candy Suzuki team had Aussie Luke Clout replace the injured Daniel Baker on the team for the west coast and the kid impressed with fast times in practice and a solid 14th in the main event.